A trip like this is far and few in between. One where time is dominated by the sun, not your phone. One where your days are dominated by the weather, not your agenda. One where the wild dominates, not the pressure of everyday life. Every stop we made shed new light on what wild is, and what it can look like. That unexpected late start was the first of many unexpected moments we would have over the extent of our trip. Waking up late and scrambling into our cars was not exactly the way we wanted to start our trip. That unexpected late start was the first of many unexpected moments we would have over the extent of our trip. After packing up the cars and exchanging eager high fives, we headed for Moab, Utah, which would be our first stop. The 5 hour drive consisted of hunting for water, ice, hot dogs, and walkie talkies to keep each other company while we caravan to our various destinations. After four and a half hours of driving, and a final stop in Grand Junction, we found ourselves nowhere. Surrounded by nothing but the soft sting of the wind and warm light of the sun. The red rock sat dormant, waiting for someone to marvel in its beauty and venture up its elaborate face. After pitching our tents and double checking for our ice, food, and beer, we hiked up to a climbing route that one of us had rubbed noses with just a year earlier; a new climb and experience for the other. However, for the more experienced, it was an interesting feeling, standing below a route that had sat unchanged, despite the tumultuous nature of our own lives and how forever changing those can be. We were both rusty, having not climbed for months. We had lost that appetite for clean walls and difficult holds, but we both knew that fire would soon be back. After starting up the wall and shaking the nerves off, the thrill of climbing was back with us. After gathering the gear and scrambling back down the rocks, we prepared ourselves for our first dinner. We grilled up two hot dogs each that we ate with a fork because hot dog buns seemed to escape our minds when we searched for supplies. It was delicious and filling after a long day of driving, along with a quick but draining climb. We sat in our camping chairs, watching the sun set in the west, as if it was beckoning us home. Just like our first day, the second day of our trip began with another unexpected road block, literally. Instead of entering Arches National Park from BLM land like we had planned, construction forced us to turn back and enter the park through the main entrance, about an extra hour away. 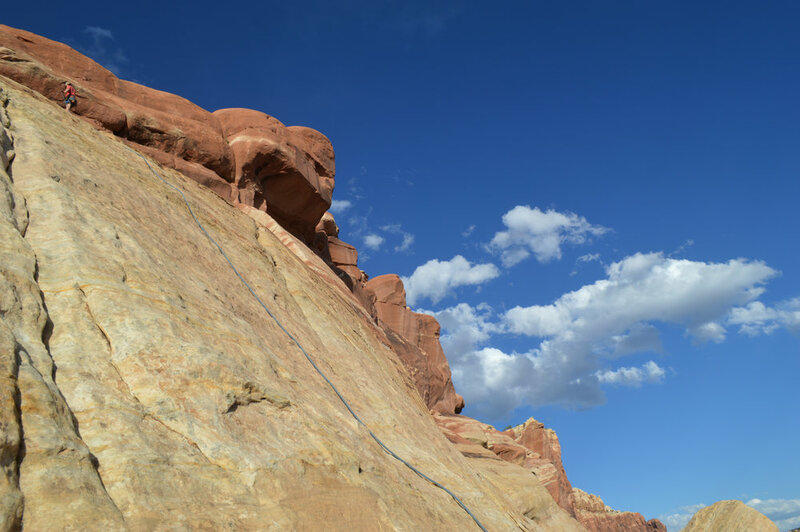 However, a bumpy start was soon alleviated by the stunning rock formations that were scattered throughout Arches. Again, the red rock stood dormant, awaiting a group of marvelling humans. The concept of time came to mind as we ventured further into the depths of this place. How long had the arches existed in this park? How do we compare with our frailty and frivolous lifestyle, while the red rock simply sits? During moments like these, where we couldn’t put into words the feeling we had, knowing that the red rocks had sat for millions of years, we decided to follow the rocks example. We simply sat, and marveled at what we could not fully understand. After a full day exploring Arches, we traveled through the town of Moab and started driving down yet another dirt road, this time in hopes of finding a stream where we could cleanse our dusty bodies after trekking through the red rocks and sand. We found a beautiful stream that was cold yet refreshing, and we immediately got right in. After basking in the afternoon sun and listening to the soundtrack of the stream, we headed into the town of Moab for a couple of supplies. While stopping for supplies, we remembered that it was Mother’s Day, and we owed our wonderful mom’s a call for their special day. They thought it was funny we had forgotten, but they were also happy to see that we were living in the moment with our surroundings. After a couple phone calls home and gathering of supplies, we headed back to our campsite, ready for the solitary sunset. On our supply run we remembered buns, so our hot dogs now could be eaten how they were intended. We sipped on cold beers and ate our hot dogs, with no worry in the world crossing our minds. We sipped on cold beers and ate our hot dogs, with no worry in the world crossing our minds. Despite the unexpected road-blocks, despite missing a few supplies here and there, we had made it through our first day in the elements in one piece. After the first stop, we found ourselves even more eager to embark upon the next day of driving than we had been when the trip began at the base of the Rocky Mountains.